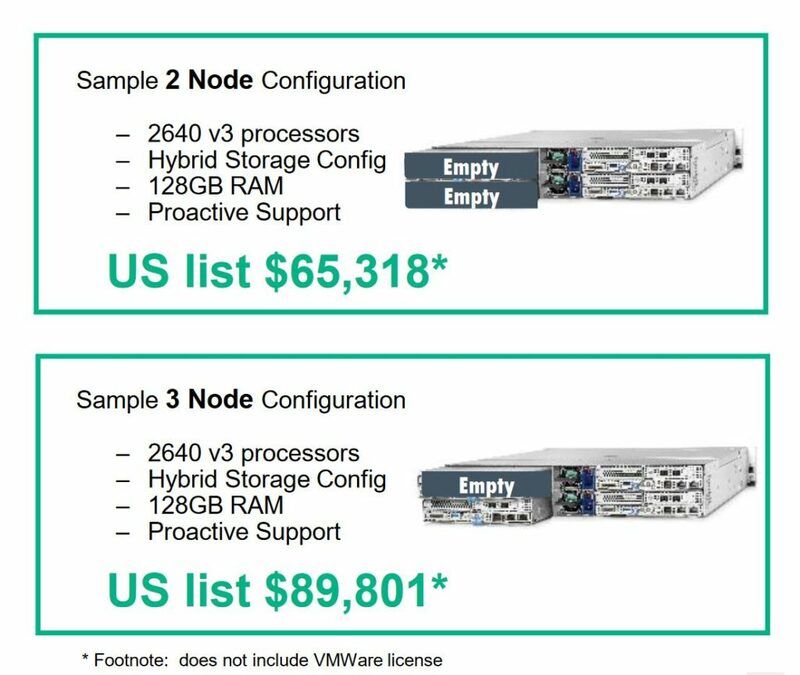 Below is the full price list for HPE Storage products for 2017. Document covers the following HPE product lines. This document gives you a basic Pro’s vs. Con’s for a variety of platforms that compete with the HPE HC250 and HC380 appliances. The analysis is was done by HPE internally and published publicly. “Designed from the ground up for the software-defined data center, the HC 250 enables a standardized, appliance approach to virtual server deployment, regardless of whether it is used as a primary virtualization platform in medium-sized businesses or as a dedicated resource pool for specific applications in the enterprise. Unlike other hyper-converged systems on the market, the HC250 can be customized and ready for virtualized workloads in a few simple clicks. Flash is great for high performance workloads, but there is always the need for speedy backup and replication routines. HPE recently upgraded its StoreOnce products by adding the ability to perform flat backups directly from any 3PAR storage appliance, such as the 20840. Keeping pace with flash-powered appliances that provide incredible throughput requires a robust architecture, and HPE designed its StoreOnce Recovery Manager Central software to perform direct backups from applications up to 17x faster and perform data restoration tasks 5x faster. Pricing is also an additional feature. The company rolled out the new HPE StoreOnce 5500, which scales up to 864 TB (double that of the nearest competitor) for as little as $0.02 per GB. HPE also offers the new StoreOnce 6600 for scale out applications. HPE indicated that the 6600 provides multi-node resiliency and can scale to 1.7 PB. The company also claims the 184TB per-hour ingest rate is 3 times faster than its nearest competitor. The StoreOnce 5500 and 6500 are available starting at $35,100 and $75,000, respectively, on March 31 2016. HPE upgraded its SPC-2 leading all-flash 3PAR StoreServ 20850 architecture to accommodate shelves of 8 TB HDDs. The resulting 3PAR StoreServ 20840 will allow customers to reap performance benefits of an all-flash architecture (built from the ground up for flash). HPE claims the 3PAR StoreServ 20840 accomplishes this feat with 85 percent less floor space, power and cooling required for traditional storage implementations, such as EMC’s VMAX platform. Customers can consolidate both block and file storage on one platform. The key principle is to consolidate workloads onto one system that scales up to 8 nodes and 21 PB of storage while providing up to 3.2 million random-read IO Per Second. HPE also announced that its entry-level 3PAR 8450 earned the #1 spot atop the SPC-1 Price/Performance tier with a cost of $0.23 per SPC-1 IOP. The 3PAR 20840 is available worldwide starting at $147,000. The inaugural products support 1,920 drives and will expand to 2,304 drives in 2H2016. The HP Enterprise HPE HC250 is priced as a mid-market Hyperconverged solution. A 2-node HC250 starts around $65,000 (plus VMWare licenses) and a 3-node HC250 starts around $89.000. No matter what size company you are, simplify your user experience and IT operations with the HPE Hyper Converged 250. Pre-configured and integrated virtualized blocks of infrastructure can be ready in 15 minutes, scale out linearly and easily integrate with a centralized data center. The HC 250 is a compact 2U/4-node virtualized platform of powerful compute and resilient storage managed as one from a single interface and optimized to handle a variety of workloads – from on-demand IT infrastructure to virtual desktop infrastructure (VDI). High availability, data protection, and back-up and recovery capabilities are built into our hyper converged solutions from the ground up. If you require simple, consistent, virtualized infrastructure, the HPE Hyper Converged 250 is designed to be quick to deploy, easy to use and simple to grow. Cost effective scaling – Configure HC 250 for VMware with choice of 2, 3 or 4 server nodes. Start with 2 nodes and grow seamlessly to 4 nodes within the same chassis using single node expansion. Additional storage and networking options – Create all-Flash, Hybrid or all-SAS configurations to meet workload needs. Choose from 1GbE or 10GbE networking to best match your infrastructure. Combines industry leading Software-Defined Storage and latest ProLiant Gen9 x86-based computing platform with robust VMware vSphere™ v5.5 or v6.0 integration. Integrated disaster recovery – Use the StoreVirtual Remote Copy feature within HC 250 to replicate to off-site servers with StoreVirtual VSA Data Protection Shield licenses. Leverage your existing VMware management tools – Use new “Remote vCenter” capability in OneView InstantOn. Designed from the ground up to simplify deployment of virtual infrastructure to support business-critical applications and virtual desktops. Features wizard-driven startup with OneView InstantOn tool that enables complete deployment of virtualized compute and storage infrastructure in under 15 minutes. Centralized management of compute, storage, and virtual machines from inside OneView for VMware vCenter assures that an IT generalist can manage the entire virtual infrastructure from a single interface without any specialized storage, server or virtualization expertise. Pre-configured and only requires the entry of IP addresses, credentials, and hypervisor license information to get up and running. Expand with ease – Using the OneView InstantOn tool, customers can add the next appliance to the cluster as easily as the first. Seamlessly add the power of four servers and scale storage capacity across the cluster without downtime. Platform integration with VMware increases functionality and ease of use while application integration simplifies storage management for applications. VMware certified stretch cluster capabilities support business continuity by keeping applications online during appliance, rack-level, or site-wide outages. Provides transparent VM failover across nodes, systems, and sites – bringing you worry-free protection in the event of a failure. Backup and recovery is equally easy with storage-based snapshots and HPE Remote Copy integration with virtualization platforms. With built-in HPE Peer Motion, data volumes can non-disruptively replicate and migrate data volumes from one Hyper Converged System family model to another, or to any x86-based server running any major hypervisor and HPE StoreVirtual VSA Software. Pre-configured dashboards help visualize system health and performance while optional VMware vRealize Operations Manager (vROps) delivers VM-level insight.